The reason for listening to live albums, for me, is one of two. Either it is listening to an album to remind you of an amazing gig you’ve been at such as Queen’s ‘Live Magic’ or the Marillion bootleg series or it is to get a different level of enjoyment of a band you wish you’d seen at their pomp, ‘Slade on Stage’ and Thin Lizzy – ‘Live and Dangerous’ being great examples. But listening to a live album from a band you don’t really know? It’s kind of a weird experience. 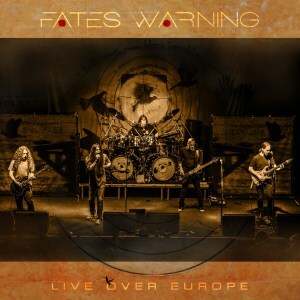 Such a band, pretty much unknown to me (despite a 30 odd year career) is Fates Warning, who are releasing their ‘Live Over Europe’ double CD (3 LP) live album on the 29th June. I didn’t really know what to expect and I must admit, seeing that there are 23 tracks on this release, I viewed it with quite some trepidation. It’s quite an epic amount of music to get through, especially if it’s new to you. Would I get through it? Would it hold my attention? Would it make me care enough to want to like it? Thankfully, it answered all my worries right from the opening track, the masterful From The Rooftops. This is a loud, dynamic, symphonic and brutal heavy metal assault on the senses, a barrage of melodic noise, crunching guitars and a piercing rock vocal from singer Ray Alder. This is music designed to be noise terrorism, a building crescendo of discordant melodies voiced by an angelic voice; OK, a Hell’s Angel but still, what a combination they make. It is Alder’s voice that truly makes this album for me. Like many more famous rock frontmen with great ranges, Alder isn’t drowned by the melodic noise behind him, he soars and rises above it, taking the various crowds with him, reaching heights that you feel can’t be surpassed until Alder surpasses them himself. The crowds are part of this show, the adulation and commitment add to the whole package of this album which has been fabulously mixed (Jens Borgen) and mastered (Tony Lindgren). The songs chosen are brilliantly paced, have moments of both introspection and crescendo; from the first tracks I genuinely couldn’t wait to see where the next song would go. It certainly has made me want to look up the studio recordings of this band. In my opening paragraph I mentioned that one of the reasons for listening to live albums was, in a sense, nostalgia for gig memories the listener may have experienced. This album, in a weird way, taps into that idea too. Listening to the album I drifted back to a time when I saw bands like Iron Maiden in smaller theatre settings, or when I saw bands like Nuclear Assault and Suicidal Tendencies in club venues. It took me back to a time when I used to work doors and stage duties at rock clubs in the North East of England as security. It reminded me, in those days before health and safety and the wearing of ear defenders, why my hearing is completely fucked! If you know Fates Warning this is a must buy release and, if you don’t I’d suggest investing in it as you won’t regret it all.